As easy as it gets. On Apache servers, .htaccess gives you great control over many important aspects of your site. .htaccess enables you to tighten security, optimize performance, configure options, and much more. Even better, .htaccess works at the server level and can be much faster than scripted solutions. This book brings together everything you need to know and takes the mystery out of .htaccess. Learn how it all works with easy-to-read text and lots of awesome .htaccess techniques. Boost security by blocking proxy servers, building strong firewalls, whitelisting access, and much more. Speed up your site with powerful techniques like file compression, cache control, and cookie-free domains. Learn how to set default server variables, enable Apache modules, customize options and much more. Customize the flow of site traffic at the server level with fine-grained control over every detail. Improve your site’s SEO by setting canonical URLs, fixing 404 errors, and cleaning up malicious links. Enhance the usability of your site with custom error-pages, browser-specific content, and plush directory-views. Learn how to redirect entire sites, directories, and single web pages to any location with ease. .htaccess made easy is a practical, hands-on guide written for admins, designers, developers, and everyone. Learn in style with over 200 full-color pages, meticulously designed with large, easy-to-read text and sweet graphics. A practical guide for admins, designers & developers. Learn how to use .htaccess to improve the security, performance & SEO of your site. Get the PDF/eBook* with free lifetime updates and all bonus material for $33 one-time purchase. SAVE BIG with Book Bundles! 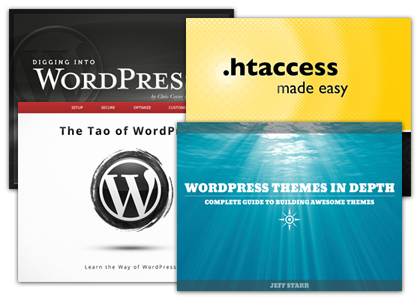 Bundle .htaccess made easy with my other books to SAVE BIG! *PDF only - does not include printed book.